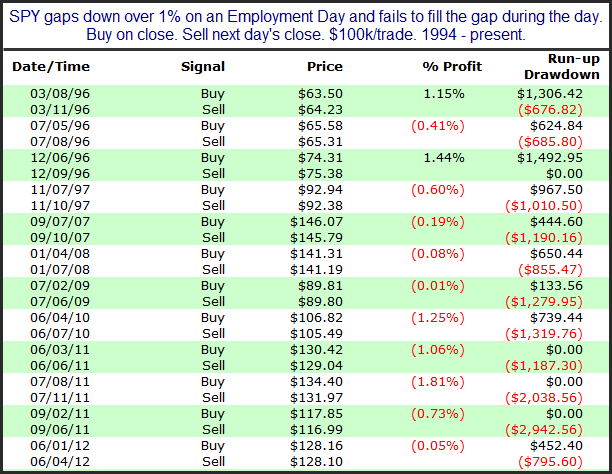 In the 9/7/12 blog I looked at the short-term importance of an unfilled upside gap accompanying a breakout. With yesterday’s breakout to a new closing high occurring along with an unfilled up gapI have revisited that study below. Results here are strong across the board. Now let’s look at instances where the 50-day high breakout was not accompanied by an unfilled gap. Interestingly, the number of instances was nearly the same. This study also appeared in the 9/7/12 blog. As you can see these moves to new highs that don’t start with an unfilled gap are much less reliable over the short-term. Technicians will often use the term “breakaway gap”. This suggests the gap occurs on the same day as a base breakout. The idea is that the new high causes excitement and the gap leaves a good amount of people sidelined or stuck short. When it doesn’t immediately fill, it leads these people to chase and helps to propel the market even higher. Interestingly, as I showed yesterday on Overnight Edges, breakaway gaps like this have not led to a positive overnight session. Strong, persistent moves often do not roll over immediately. Real persistency can set up a situation where strength begets more strength. An example of that concept was triggered with Friday’s setup, where we had the 1st down day after 5 consecutive higher closes. Initially there appears to be a moderate inclination for a bounce. Once you get out 9-10 days the upside edge appears very substantial. Based on this, there appears a good chance that the dip that started Friday may not get too far before the market again moves higher. I am looking at a mix of bullish and bearish studies right now. One indicator arguing for the bears is the VIX. The VIX is a measure of volatility and it typically moves counter to the SPX. So it will most often rise when the SPX moves down and it will drop when SPX rallies. Yesterday both the SPX and the VIX closed higher. And they did so for the 2nd day in a row. 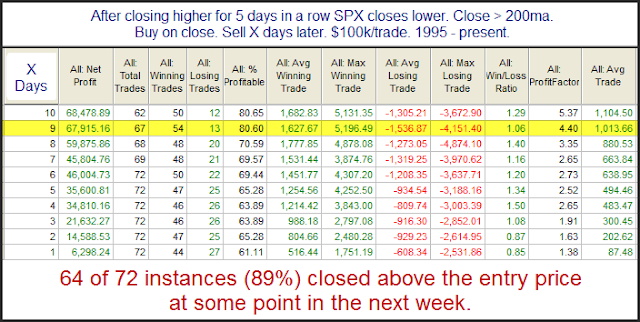 The study below is an old one that looks at other times this has occurred and the market is in a long-term uptrend. All results are updated. While not overwhelming, the numbers here provide the bears some hope over the next 1-2 days. 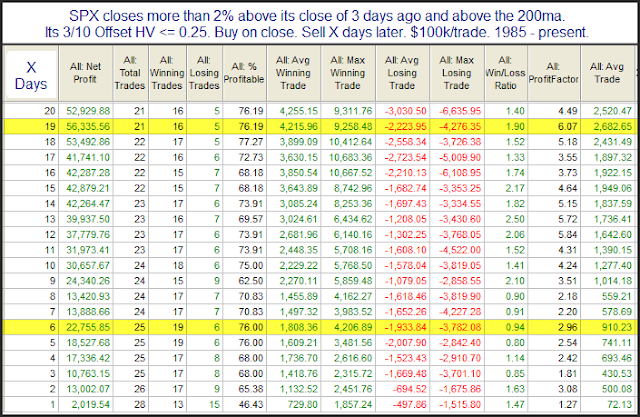 In July of 2009 I introduced the 3/10 Offset HV indicator. It essentially takes a short 3-day measure of Historical Volatility and compares that to the 10-day measure of 3-days ago. Low readings indicate there has been a contraction in volatility. High readings indicate there has been an expansion. Anything at or below 0.25 is regarded as extremely low. Often after sharp contractions we see a volatility expansion take place. 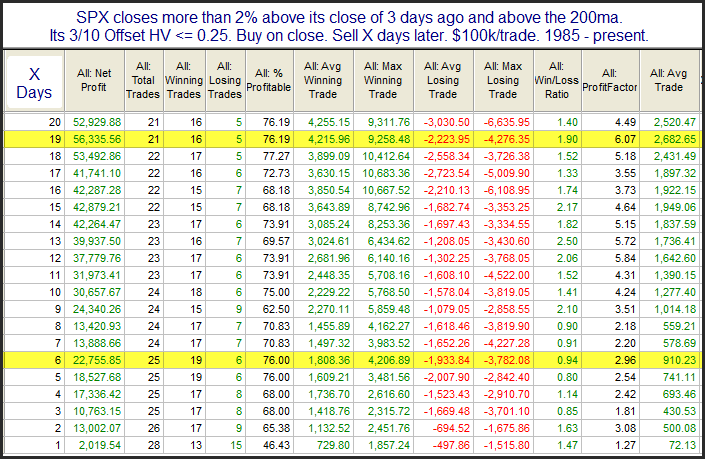 On Tuesday the 3/10 Offset HV for SPX came in at just 0.22. I found it particularly odd that the 3/10 Offset HV was so low considering we've seen a fairly strong move higher over the last three days. Wondering whether that meant downside risk is now greatly increased, I ran a study. I found it quite interesting that the numbers here all seem to suggest an upside edge. I suppose to get the 3/10 Offset HV indicator that low while the market is rising so strongly would require some volatile activity prior to the bounce. Being above the 200ma, that scary, volatile period will often pave the way for a continuation of the rally. I am seeing a real mix of evidence right now, as neither bullish nor bearish short-term evidence is dominating. The study below is one example of a study from last night’s letter with possible bearish implications. It examines 2-day moves like SPY has just encountered. The suggestion here is that more downside appears likely over the next few days. Today is the day taxes are due in the U.S. The reason tax day may be important is that it is the last day that people can make IRA contributions to count for the previous tax year. This can create a last-minute rush and you will often have an inflow of funds heading into the market right around and on April 15th. Fund managers will often put this money to work immediately and it creates a positive bias for the market. Tax Day itself seems to have benefited over the years. Below are some stats that demonstrate this. Employment Days will often occur in conjunction with a strong price move because the employment report is frequently viewed as an important piece of economic data. Still, it has been quite rare to see the employment report lead to a large gap down that never fills during the day. This happened on Friday. When it has occurred in the past selling has generally continued into the next trading session. This is something I last showed in the 9/6/11 subscriber letter. An updated list of all instances is below. As usual, it should be an interesting day..
Large-caps definitely held up better than the rest of the market on Monday. Coming from a 50-day high, this caused the study below to trigger. It was last seen in the 9/18/12 letter. Stats are all updated. The implication here is that when the SPX is coming off a high level and it holds up relatively well despite broad selling, it will often have further to drop. The selling in the broad market could spill over into the large caps. There’s a chance they could even play catch-up to the downside. The good news for bulls here is that the bearish inclinations have only lasted a couple of days.